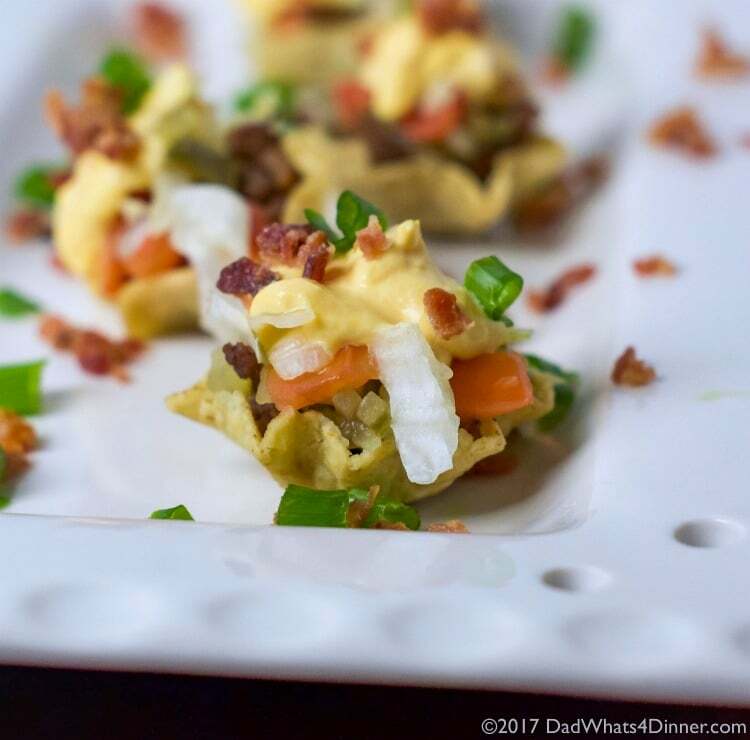 When you’re craving the flavors of a cheeseburger but want finger foods instead, then my Mini Cheddar Bacon Cheeseburger Nachos are sure to please. The perfect appetizer for the Big Game! 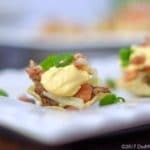 I am always looking to create unique and easy appetizers the whole family will love tan the easier the better. Who wants to waste the day cooking when you should be watching the game and having fun with family and friends. I love a good burger but serving them for the Big Game is just a little too much work. My favorite burger includes good ground beef, pickles, lettuce, tomato, with cheddar and bacon. When I was thinking of making my favorite burger as an appetizer I thought it would be a little much to stack all those ingredients in a bite-size snack. 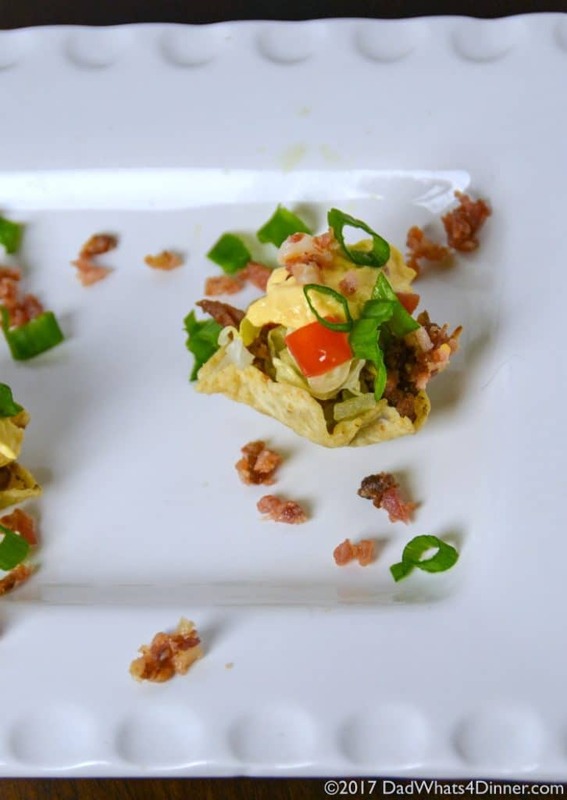 That is when I came up with these Mini Cheddar Bacon Cheeseburger Nachos. 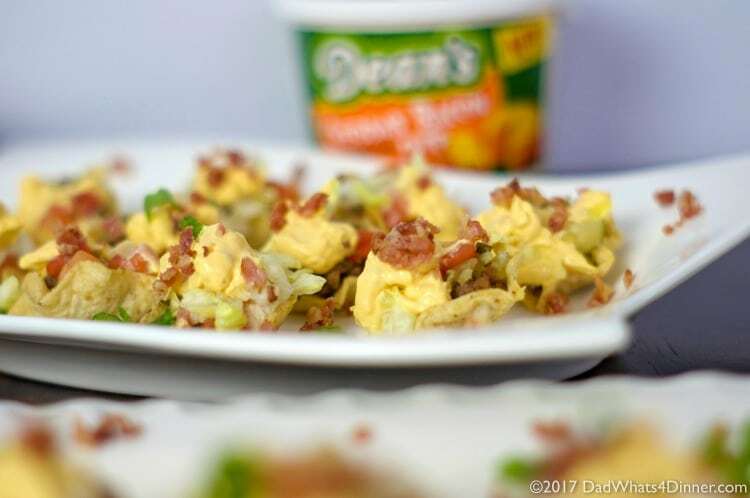 The recipe is even easier when I found Dean’s Cheddar Bacon Dip at my local Walmart. 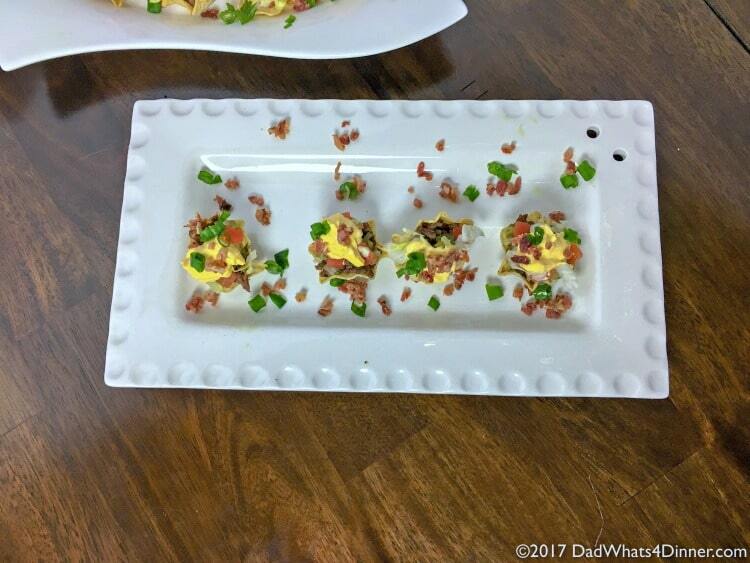 The dip makes finishing off these Mini Cheddar Bacon Cheeseburger Nachos so easy and gives the great flavor of cheddar and bacon. Everyone knows “Everything tastes better with Bacon”. Dean’s Dip deliveries a dairy fresh taste since they are refrigerated. Dean’s dip is so convenient and a great with chips or as a topping to your favorite recipe. 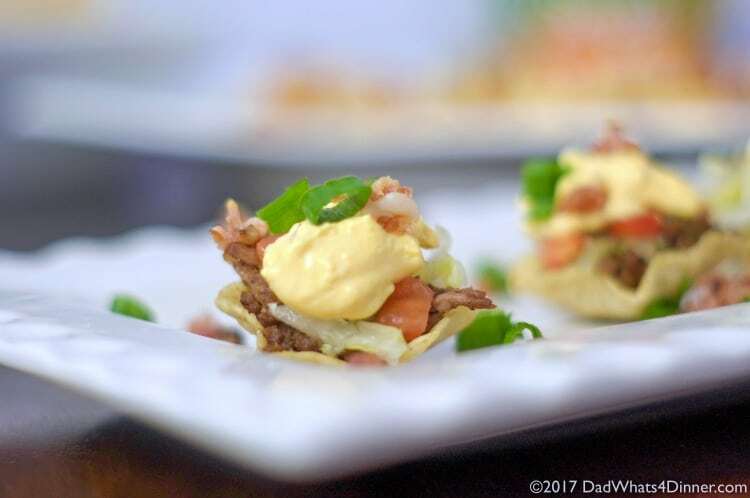 When you are craving the flavors of a cheeseburger but want finger foods instead, then my Mini Cheddar Bacon Cheeseburger Nachos are sure to please. The perfect appetizer for the Big Game! Brown ground beef in medium skillet; drain. Stir in seasoning salt and water. Simmer for 5 minutes, stirring occasionally. Arrange chips in single layer on a serving tray; fill equally with hamburger mix, pickle relish (optional), tomato, lettuce, and Deans Cheddar Bacon Dip. Top with bacon bits and green onion. What is your favorite appetizer to enjoy during the Big Game? Click here to get a $1 off one Dean’s Bacon Ranch or Cheddar Bacon Dip. The Big Game doesn’t get any easier!